Janelle Monae creates art through everything she touches. This week's Broke Girls Guide is dedicated to one of my favorite singer/songwriters. Not only does she have some incredible music to listen to, but she has an incredible sense of fashion. She genuinely creates a piece of artwork through each outfit she wears. 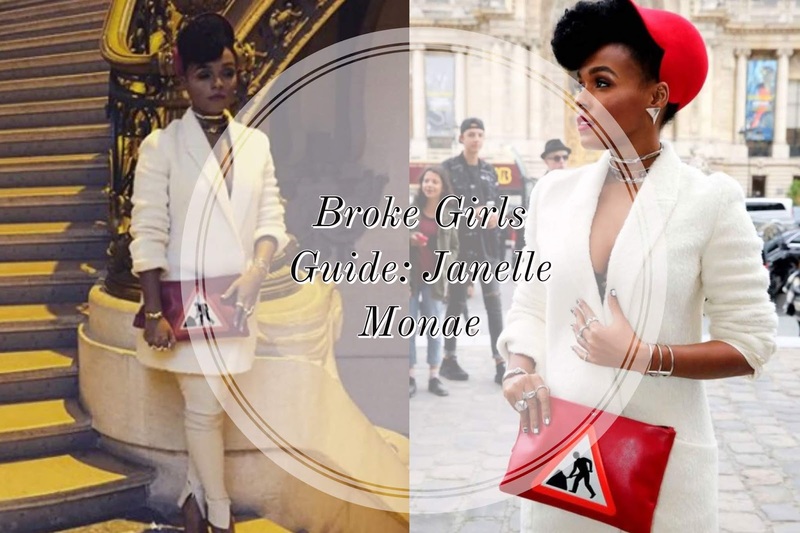 Known for her pantsuits, Janelle Monae finds a way to add masculine and feminine pieces together that we can all adore. She also hails from my home state, Kansas, and has recently helped share her support for our new Governor Laura Kelly. If you haven't heard any of her music yet, I highly suggest you go to Youtube and check it out. They morph rap, pop, and unbelievable imagery to each of her videos. When it comes to her fashion, I feel like she uses her music to inspire the outfits she puts together. For this article, I chose a classic look that she regularly wears. This specific ensemble was worn during fashion week and popped out to me the second I saw it. With the light colors, bold pops of red, and accessories, this is definitely a look we can all rock this winter season. I cannot tell you how much I adore the color combination she chose for this outfit. The all-white pantsuit matched with the red pops of color looks incredibly chic and sophisticated. Depending on what you are looking for, you could reach for a pair of skinny jeans or get a nice pair of trousers. For my dupes, I went for a classic pair of white denim that would look great with almost anything in your closet. I personally own a pair of white jeans and can honestly say they have become a staple in my wardrobe. They add a unique flair to any outfit and are a great color to match with anything. This jacket is a coat, sweater, blazer, and robe all in one. While I can't personally touch it (that might be weird), I feel like you can just see how soft it is. Finding a duplicate for this piece at a fraction of the price was not easy, but not impossible. You could pair this with an oversized blazer or go on a hunt for a double-breasted coat. Again, this is a jacket that could be paired with almost anything and used as a daily cover up during the colder months. I'm not necessarily sure if she is wearing a shirt or just a fancy bralette. Either way, you can probably find something in your own wardrobe to pair with this look. I found a couple bralettes and a cropped tank that would add a little sexiness to this piece. For the life of me, I could not find this one of a kind hat. If you do find a cheaper alternative, let me know in the comments below, and I'll add it here! That being said, you can find a cute red hat that would look amazing with this outfit. While you could use any color to accent this piece, I adore the bright red that she picked. When it comes to the shoes, you can find block heels like hers at Forever 21 or add a little edge with the Cape Robbin studded heels. I get it, we all know how much I love accessories. To me, you can never have enough (even though you certainly can). The array of silver jewelry brings everything together to give this look that feminine/masculine feel. I've always loved jewelry because it can add a new dimension and feel to a look. You can also get amazing pieces for relatively cheap (although some of them will turn your fingers green). Whether you choose a few of these dupes below or just find pieces lying around your house, don't be afraid to stack to the heavens. For the clutch, you could probably go searching at your local thrift store for a whimsical piece that doesn't cost over $300. With the perfect color match to the hat, this is a great accessory that tells a story. If you want to get this look at an even lower price, you could find an inexpensive clutch and an iron on to make a one-of-a-kind item. Overall, I feel like this is an incredible outfit that has a comfortable feel while still being bold. You could wear this to upcoming holiday parties or any special occasions coming up. What are some of your favorite outfits worn by the incredible Janelle Monae? Let me know in the comments below, and I'll choose one to add to the Broke Girls Guide series.